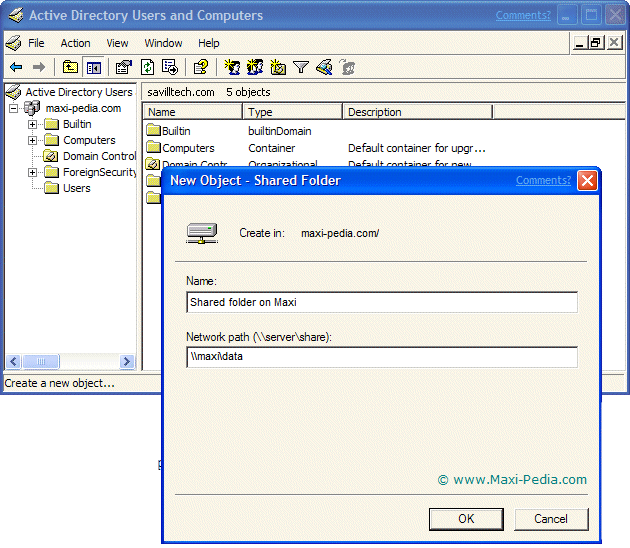 What does it mean to publish shared folder in Active Directory? There are many ways and methods for sharing resources on a Microsoft network, and which method you choose depends on your situation and requirements. One method is applicable for home networks, another method would be more suitable for corporate networks. When we talk about publishing a shared folder in Active Directory, we talk about the mid-scale approach suitable for small- and mid-size networks. To explain the How to publish shared folder in Active Directory question, let's start with an easy example. You have a computer A in one room, and you want to make a folder on this computer accessible from another computer B on your home network located in your other room. You share this folder on computer A and then use Explorer on computer B to navigate to it. You browse to a specific machine or know the complete share Uniform Naming Convention (UNC) path to the shared folder in advance. This solution will work on your home network. But what if you connect your home network to your company network and want to allow your secretary to have access to this folder from your office? In this case, your option is to publish your shared folder in Active Directory (assuming your business network uses AD). Your secretary will be able to search for your folder and access it easily without the need to know the technical details such as the physical location of your shared folder or the UNC path to it. With your shared folder being published in Active Directory, your secretary will be able to search your domain tree in her Explorer to visually navigate to your shared folder. Now you probably ask How to publish shared folder in Active Directory? When you publish a shared folder in Active Directory, you make it easily available to your network users. This option gives you a good way to handle permissions too. When you publish a shared folder in Active Directory, you have the ability to assign access permissions on the Active Directory level instead of on the folder level which makes access administration easy, centralized, and transparent. Publishing shared folders in Active Directory is a good approach for small and mid-size networks. If you wish to learn about how to make shared folders available throughout large networks, see the What is DFS page. DFS is a large-scale solution for sharing files and folders on networks. What do I need when sharing a folder in Active Directory? Making your network drive or computer folder available to your users out there is a two-step process. First, you need to share your folder. Once you have a shared folder, then you can publish it. -> and lastly enter the share's UNC (Uniform Naming Convention) path in the display dialog box (it is something like \\Server.domainname.com\shared_folder or \\server\shared_folder). The print screen above shows How to publish shared folder in Active Directory. As you can see, this is much easier than having to remember the UNC path in order to connect to the shared folder. If you want to remove the new share, simply right-click the shared folder in the Active Directory Users and Computers snap-in, and select Delete. -> and then click Shared As. Populate the folder with documents and if you wish to make it available to users on your network, publish your shared folder in Active Directory. Your users have by default permissions to publish shares in Active Directory. If you want to manage their ability to make resources available to others, review the group policy called Allow shared folders to be published. Another group policy related to sharing folders on the network is called Allow DFS roots to be published.